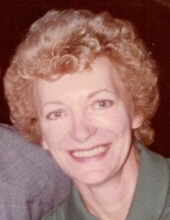 PEORIA—Jessie M. Noll, 87, of Peoria, passed away at 9:25 p.m. Sunday, March 31, 2019 at UnityPoint Health – Methodist. Born August 23, 1931 in Glasgow, Scotland, a daughter of Michael and Jean Murray Delacy, she married Robert Noll April 14, 1951 in Peoria. He preceded her in death September 28, 1982 in Creve Coeur. Also preceding her in death were three sisters. Surviving are four daughters, Anne (Jim) McCaherty of Chillicothe, Lisa Noll of Peoria, Mary Armstrong of Peoria, Amy (Dan) Kijner of Malibu, CA; four grandchildren, Julie (Joe) Battaglia of Frisco, TX, Allison Armstrong of Peoria, Hannah Kijner of Malibu, CA. Sam Kijner of Malibu, CA. ; three great-grandchildren, Jake, Brock, and Elle Battaglia all of Frisco, TX. Jessie retired as a Real Estate Broker, in 1994, working for several Peoria Realtors. Jessie’s family was her pride and joy. Nothing fulfilled her more than cooking an amazing meal for them, celebrating holidays together & summer vacations camping, boating, skiing & canoeing @ Big Lake, WI. Per her request, no services will be held. In lieu of flowers or donations, raise a glass of wine and toast to a life well lived. "Email Address" would like to share the life celebration of Jessie M. Noll. Click on the "link" to go to share a favorite memory or leave a condolence message for the family.